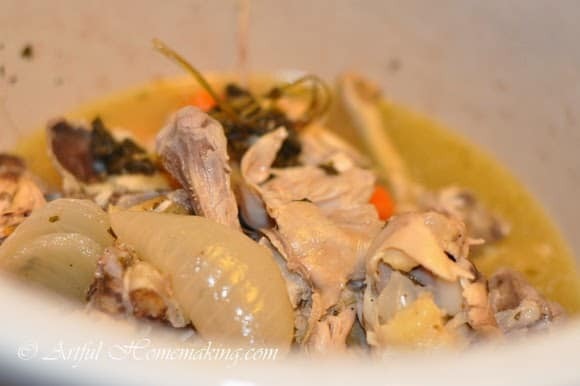 Crock Pot Chicken Stock is easy to make. 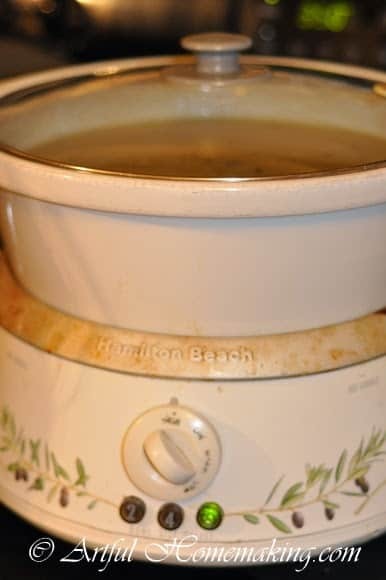 This tutorial will show you how we make homemade chicken broth in our slow cooker. Chicken Stock ready for the freezer. In my teen years I became interested in eating healthfully, and spent a great deal of time at our local Whole Foods Market. For my birthday one year, my mom gave me a cookbook about whole foods, and I learned so much from that first introduction. One of the things I learned from this book was how to make my own stock. For years I made it regularly, using a large stock pot on the stove. 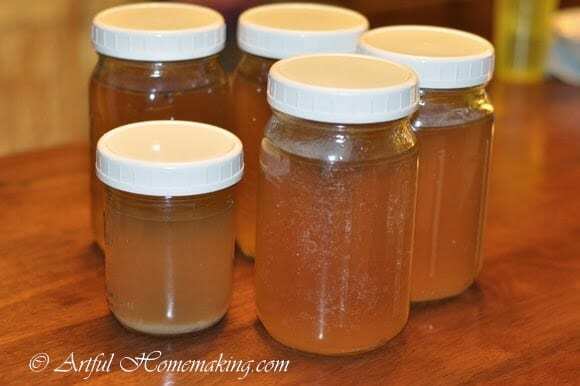 Several years ago, however, I learned an easier, quicker method for making stock, and now I make it usually once a week, because it’s so easy. A friend asked how I make this, so I thought I’d share it with you here. First, I begin by making baked chicken. And I do this really simply, also. I just wash the chicken, sprinkle some sea salt and lemon pepper over it (or freshly ground black pepper, and sometimes I add rosemary or other herbs if we have them growing–or you can also use dried herbs or spices). When I serve the chicken, I remove all the meat from the bones (I don’t serve the meat with bones, because I want to use those bones!). Then, I just put the bones in the slow cooker along with the leftover juices, fat, etc. Cover with water and add a few tablespoons of apple cider vinegar, about 10 peppercorns and some celery from the freezer (and parsley, if I have it). I save the center parts of the celery (and even limp celery that we just didn’t get around to eating before it lost its crispness) in a freezer bag, just for the purpose of making stock. I turn the slow cooker on high and let it cook for several hours on high. Before I go to bed, I turn the temperature to low, and it cooks all night on low. By the next afternoon, I will turn the slow cooker off and let it cool for a bit. Then I strain the stock. At this point, you can either use the stock right away or freeze it. We often will have soup in the winter on the day that I make stock, but I also like to have a supply in the freezer. I also have a collection of recipes that call for chicken broth, and sometimes I will use the stock in those recipes, instead of making soup. 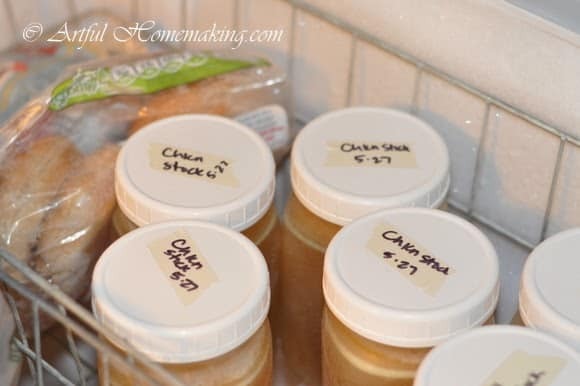 To freeze the chicken stock, you can use plastic freezer containers, plastic zip bags, or glass canning jars, which is my preferred method. I’ve used all three of these freezer containers, and they all worked fine. 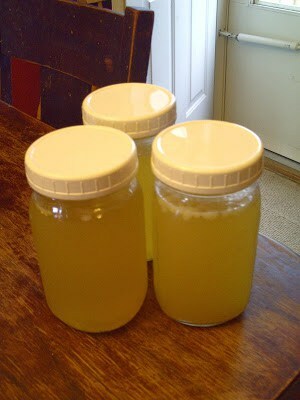 If you choose to use glass canning jars, the wide mouth jars are recommended for freezing. I try to leave a good bit of head space at the top (about 1 1/2 to 2 inches). The narrow mouth jars are prone to cracking in the freezer. I found a helpful article here and here on this topic. The plastic lids I use on my jars are these Ball lids here. You can also just use the two-piece canning lids. So, that’s all there is to making crock-pot chicken stock! It’s really very simple, and easy to fit into the weekly routine. I'm so glad if this was helpful to you, Andrea! I make chicken stock like this at least once a month (sometimes once a week), and it's so easy and works great! 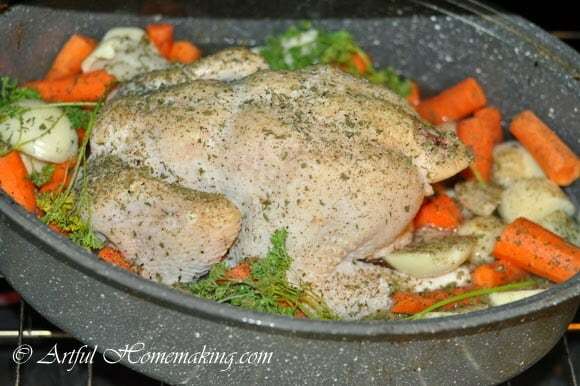 This is really so easy, Heather, and I always love knowing I've used the whole chicken. And it's so much better than store-bought. Many blessings to you as you prepare for your upcoming marriage~such an exciting time!